Recently I posted about my first cologne from The Library of Fragrance. Well I've already added two (I know there's three in the picture, I'll explain below!) new fragrances to my collection that I was lucky enough to win. The Library of Fragrance held a competition where you could suggest new scents using Twitter, Instagram and I believe Facebook as well. I enjoyed trying to think of unusual smells that I really like that they could possibly release in the future, although several that I came up with I discovered that they already sold (leather, cut grass and ice cream for example). On Twitter I can't remember exactly what my suggestion was but it was either 'new carpet' or 'new car' and I also entered on Instagram with 'Arctic air'. I'm not sure which entry won (I believe it might have been randomly selected rather than based on suggestion) but I was one of five winners and was sent three of their floral summer scents. I'll start off with Iris as unfortunately this one isn't for me. This reminds me of Lush's Ultraviolet bubble bar which I also didn't like. I personally find Iris a little strong and overpowering and it actually starts to give me a little bit of a headache after a while. I tried to pass this on to both my mum and my brothers girlfriend but neither of them was keen on this either, so the hunt for a new home for this continues. I think my favourite of the three has to be Apple blossom. I'm not entirely sure what apple blossom does actually smell like (due to years of severe hay fever I tend to avoid sniffing plants/trees/flowers!) but this is a very pretty cologne. Whereas my first cologne, Baby powder, is quite a subtle scent I find this one stronger, but not too strong or overpowering. This has a lovely balance between sweet and floral and it does make me think of spring and flowers starting to bloom. I'd actually never heard of peonies before until a few months ago when I noticed they appear to be popular in Instagram pictures. So like Apple blossom I have no idea what peonies smell like. This makes it almost impossible for me to describe this one because there isn't anything I can recognise like sweet apple, but it's a very floral scent (obviously as it's a flower!). So if you're really not a fan of floral scents then this one won't be for you. These ones appear to last a little longer than Baby powder, but I think that's because they're stronger scents so you're more aware of them. As I said I'm not personally a fan of Iris but I love both Apple blossom and Peony and they're both perfect for this time of year (when we should actually be experiencing a summer!). All three are available on The Library of Fragrance website and may be available at Boots if included in their smaller range. 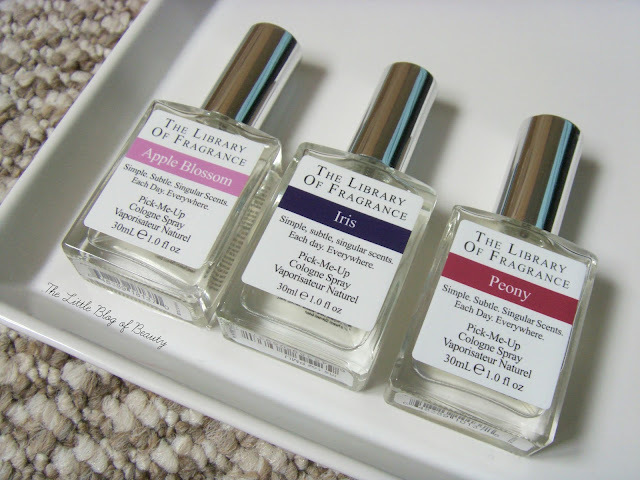 What scent would you like to see The Library of Fragrance do?